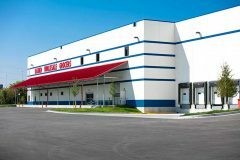 Banner Wholesale Grocers moved into its brand new 75,000-s.f. facility in Chicago in September. After closing for a few days to move, the store reopened Sept. 25 in the new space. 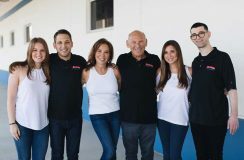 Company President Richard Saltzman counts his blessings: his great customers and employees; his children, Ryan and Carly, who are the fourth generation to come into the family business; and a business that is doing well. Saltzman talked to The Shelby Report’s Midwest Editor Terrie Ellerbee one week before moving to 2639 South Damen Avenue. That’s where the new Banner Wholesale Grocers was built from the ground up. The Shelby Report: You are unique. You serve everybody—grocers, restaurants, even other wholesale companies. How is business these days? Richard Saltzman in the new Banner Wholesale facility before the company moved in. Richard Saltzman: Business has been very good. The market has been good. I’ve been in business for 93 years and the company is now into its fourth generation. Our adapting to what our customers’ needs are has been our biggest success. Years ago, we used to be tobacco distributors. Now, we have more Hispanic products. Some of the American products don’t fit in anymore today. It seems like there’s a nice crossover, that all people, people from all different types of ethnic backgrounds, are looking for Hispanic products. TSR: Has your company always carried those products? How much interest has there been for them outside of Hispanic supermarkets? Saltzman: It is of major interest. We see it in certain products. One product is a sparkling mineral water out of Mexico called Topo Chico. Demand is everywhere now. It’s not only in Hispanic neighborhoods. It’s all over. TSR: Shoppers do seem to be getting more adventurous. Saltzman: Exactly. That’s the word. And I think the younger generations, they really enjoy other ethnic foods. The stores are finding out that if you only carry macaroni and cheese and spaghetti, you are limiting yourself. They’re finding that they’re bringing more items in from different countries or they’re bringing in items that have an ethnic theme to them and they’re doing really well with them. TSR: Tell us about the range of products that you sell. Saltzman: We do dairy. We do frozen. But most of what we have is shelf stable. Beverage is big. The pops from Mexico and Coca-Cola are very strong. TSR: What sets you apart? pick out your own stuff. We offer “call in your order” and we’ll pick it so you can pick it up the next day. And then, you can call in your order for delivery and we’ll deliver it in two days. We offer all of those services to our customers. TSR: How does your area seem to be doing economically? Saltzman: We are near the South Side of Chicago. We’re an industrial area where there’s a lot of distribution companies. I actually bought and built at the right time because property values are very strong and keep on going up, which is really good. TSR: Tell me about the riverwalk (pedestrian waterfront) you built. Saltzman: I bought the land on the Chicago River, and Chicago has an ordinance that says anybody who has river land and wants to build on the river must build a riverwalk. So, I built a beautiful riverwalk on a side of the building right next to the river, which is really nice. It should be nice for my customers. TSR: I saw on your website that you’re hiring drivers. Is having enough of them a big issue now? Saltzman: Right now, we’re good. That is always an issue, and when we were expanding, that was a problem because we put on two, three trucks. It’s a challenge with help, with keeping help. It’s always a challenge. And the rule that they can only drive for 11 hours, the regulations, since then it’s really been a nightmare. TSR: There has been a lot said lately about the great recession that began 10 years ago. How did you come through it? Saltzman: Ten years ago, there were about 10 wholesalers like myself. Through that recession, eight of them went out of business. There are only two left. I actually have family and a partner in this business and we looked at each other and said, “well, maybe this business is only good for one family,” so he decided to sell. I bought him out and ever since we’ve grown in double-digits every year. TSR: Was that 10 years ago? Saltzman: Yes, double digits every year. And it has a lot to do with the kids going into the business. I was very fortunate that two of my kids wanted to go into the business, so I think (others) may have a problem keeping it going. And, thank God—I mean everything turned out just great. TSR: You are blessed. A lot of young folks look at the grocery business and it looks like hard work. Saltzman: Yes, the grocery business is 24/7, and in the new place, we’ll be open for 24 hours six days a week. Saltzman: Yes. We used to shut down for four or five hours a night. During the day it’s cash-and-carry, so the customers can walk in and pick out whatever they want. Then, later in the afternoon come the order pickers. At about 11, 12 o’clock at night, I’ve got a crew that comes in to replenish. They’ll put everything back on the shelves and make sure everything’s clean so when we open up at 5 in the morning to the retailers, everything is in order. We have to go 24 hours. TSR: You said you and one other wholesaler made it. Who is the other one? 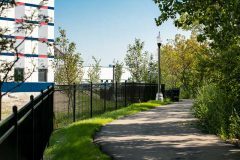 Banner Wholesale built a riverwalk along the Chicago River. Saltzman: La Hacienda. It’s funny, the two of us started out in this business about 30 years ago and then all these other guys came and left and it’s still the two of us. TSR: Why do you think you made it? Saltzman: The big guys, their challenge is they’re up against the Walmarts and the Amazons of the world, where I’m in a niche business. People like to go to the store. They like a little bit smaller store. They like a store with all the things that they want, like bakery and produce and meat, besides the grocery part of it, so that’s why these little stores do so well. And we are 95 percent in stock and our service is tremendous. TSR: Back when you started, was it predetermined that you would take over the business? Saltzman: Yes. I started out with my father in 1968, so I’ve been doing this 50 years now. I was with my father for 30 years over in the “south water market” in another building. He passed, and I had to move to Ashland Avenue about 17 years ago. Now I have been fortunate enough to build my own place. This is a move of expansion. This is a move because we got bigger and we needed the room. TSR: What a fantastic problem. Saltzman: Yes, I love those. TSR: The new facility has a taqueria. Why did you decide to add that? Saltzman: That’s something new. A lot of our customers come from out of state. We cover about a five-state area around Illinois, and they’re on the road for three, four hours. I noticed throughout the years that they’re always asking me, “where can I eat” or “do you have a washroom? They’re road weary. So, I thought that in this place I wanted to emphasize that a little bit. Come here. It’s a destination. They’re all from small towns. You don’t have to worry. We have a little taqueria. Relax and then shop. And that’s what we’re trying to create. 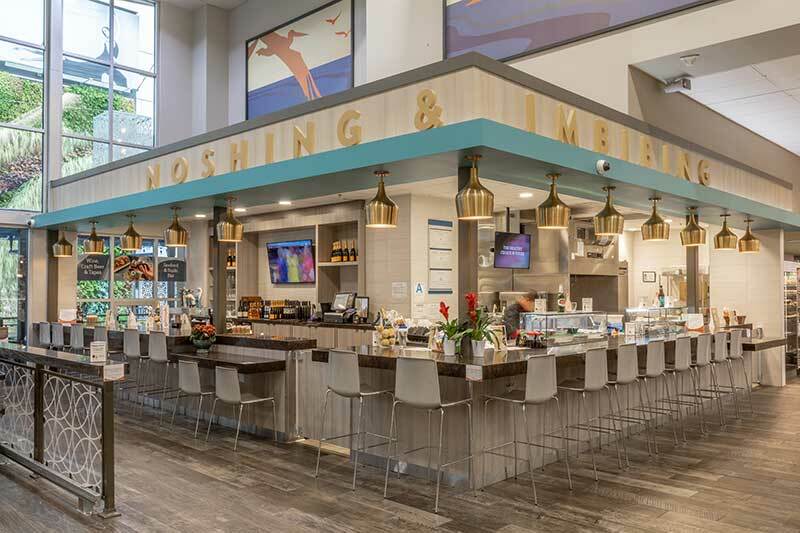 TSR: Here’s a long-term question: Other than technology, how have you seen the business change over time—and maybe not your business, necessarily, but the grocery business? Saltzman: When I started in the business, the little corner grocery store used to sell the newspaper, used to sell the coffee. People would go in and get a pack of cigarettes or gum. Today, the only way you’re going to buy a pack of cigarettes is to get in your car and go to a convenience store or a gas station. There’s no newspaper anymore; everything’s online, and coffee was taken over by Starbucks. So, all the little things that brought people into that corner grocery store, they just ended up dying out. TSR: And then Amazon comes in and tries to take away the center store. Saltzman: It’s something. I live in an apartment building and I can’t believe how many packages are delivered daily. It blows me away. And a lot of food products, too. I can’t believe it. You wonder how they can pay all that money on the freight and everything like that. It’s just amazing. TSR: Do you supply any unusual customers? I saw somewhere that Menards (home improvement retailer) offers groceries now. That’s another problem for independents. Saltzman: No, we have mostly the independents here in Chicago. Some guys have three stores, some guys have 15 stores. We’ve been in the market a long time. We knew them when they first started the business, so we get a nice business out of everybody. TSR: Big picture—what is the No. 1 issue they face today? Saltzman: Product, what to carry—product line is a real challenge. Knowing your customer well. Today you have to keep some type of uniqueness to have people come to you. And of course, your offering. TSR: You have the floor if you would like to talk about your business in general. Saltzman: It makes me feel really proud to know that we’re a 93-year-old company. I respect and think about my grandfather (Ben Friedman), who I knew well. And of course, my father (Irving Saltzman), who I worked with for 30 years, and my mom (Shirley Saltzman) was very much a part of the business. And now having my kids in the business has really been a thrill, and seeing it going into the fourth generation—seeing us going into our own modern new warehouse that has our personality stamp on it and our business stamp on it—I am real excited about these things. I still work six days a week after 50 years. I mean, my drive is there and I enjoy what I’m doing and that’s because we have great customers and great employees. Of course, I couldn’t do without my employees. Great employees. And I’m very optimistic about the future. Isabel, Ryan, Liz, Richard, Carly and Sammy Saltzman. TSR: Your grandfather and parents would be so proud. Your grandfather probably never would have thought that you would build a riverwalk and a taqueria. Saltzman: You know, it’s funny. We’re all cash-and-carry people, which I think has been another one of our successes. 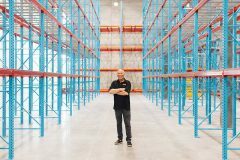 We also designed the new warehouse to service customers who want to spend more time here. That’s why I put a taqueria in. I want people to come down, feel relaxed and shop. They’re from small stores. I want them to know we’ll always be there. We have 95 percent of the stock of whatever they’re looking for and that’s the emphasis. That’s a big emphasis. TSR: You have a solid company. You’ve been there and you’re still there. Saltzman: Yes, and we’re not going anywhere.